The Doctor arrives in what later stories will reveal is the first appearance of Stockbridge in the comics. There he finds robotic invaders from another dimension led by General Ironicus. The Doctor tries to stop him but ends up taking the TARDIS into the Iron Legion’s home dimension, where Rome survived and conquered the world. Now they want to conquer other dimensions as well and want the Doctor to help them since his ship can jump dimensions. Of course he refuses and ends up on a slave ship where he meets the cyborg Morris. He also sees the child emperor Adolphus Caesar but notices something is odd about the boy’s mother. He and Morris escape, meeting a oil-burning robot named Vesuvius. He takes our heroes to meet the gods of this Rome, whom the Doctor recognizes from his home dimension, or at least their species: the Malevilus! What they got right: On Marvel US’s side the comic ends with some minor information about the character, which is important to the story for anyone who hadn’t watched the show (at the time airing on PBS in the States). They also added in color and it’s well-done. I like the eagle (hawk) headed design of Ironicus. He also makes a good villain. What they got wrong: “Adolphus” Caesar. Just in case we be accused of subtly? I’m guessing the bit with the British sportscaster at the games is supposed to be a joke the UK readers would get but for me he just looked out of place. They may not have expected too many US readers to see this story though so I can’t really fault them that. Recommendation: A good start, and it was a good idea on Marvel’s part to use this series as a test pilot for a full comic run, which I believe Marvel Premiere was for. Posted by ShadowWing Tronix on July 11, 2018 in Television Spotlight, Yesterday's Comics and tagged Doctor Who, Marvel Comics, Marvel Premiere, The Fourth Doctor. I still have this issue from when I bought it in 1986 or 1987 while in middle school. 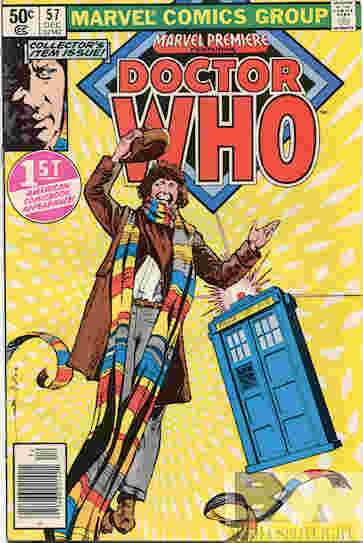 This truly was the Doctor’s first appearance in a North American comic book. The year was 1980. At that point, Doctor Who had only been playing on American television (largely PBS stations) since around 1977 or 1978. Canada might have had Doctor Who shows on television a few years before 1977 due to Canada’s status as a member of the British Commonwealth. This Marvel comic must have surely introduced even more Americans to the wonderful world of Doctor Who. The whole Marvel Premiere run of Doctor Who is definitely worth getting as is the later Marvel Doctor Who comic series that started up in 1984.